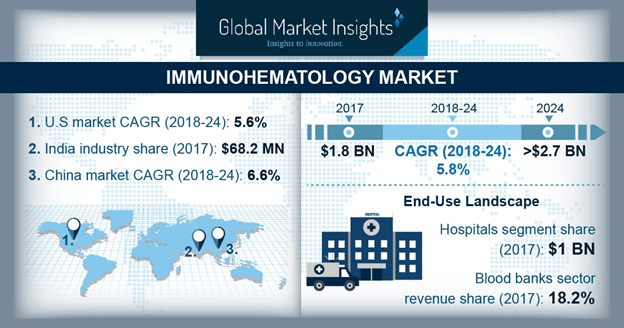 Immunohematology Market size is set to exceed USD 2.7 billion by 2024; according to a new research report by Global Market Insights. Increasing number of blood banks and trauma centers in developed countries such as U.S. will augment the immunohematology industry growth in upcoming years. For instance, according to America’s Blood Centers, there are more than 600 blood centers in the U.S. and around 19,000 pints of blood are collected annually that will increase demand for immunohematology devices for blood group determination. Moreover, growing number of not-for profit organization supplying blood to over 3,500 hospitals will further strengthen the demand for immunohematology analyzers stimulating immunohematology industry growth in forthcoming years. Growing number of blood donation and blood transfusion awareness program in developing countries should escalate industry growth during the forecast timeframe. For instance, blood donation program organized by WHO helps in spreading awareness regarding blood donation ensuring safe supply of blood boosts the demand for immunohematology analyzers. Also, WHO arranges blood transfusion safety programs that spreads provides technical assistance and policy guidance for ensuring universal access to safe blood and blood products, thereby propelling industry growth. However, high cost of immunohematology instruments will hamper the industry growth in foreseeable future. Reagents segment was valued at USD 1.2 billion in 2017 and is expected to have considerable revenue size during the forecast timeframe. Growth of segment can be attributed to the high utilization of hematology reagents in blood transfusion process. Key industry players manufacture superior quality reagents that are typically used in accurate antigen detection. Also, many reagents detect anti-globulin with high specificity that has increased its demand over years escalating segmental growth. PCR segment will experience 5.8% CAGR during the forecast timeframe. Considerable segmental growth will be as a result of growing use of PCR technique in diagnosing the genetic blood disorders. High prevalence of rare hereditary blood disorders will elevate demand for PCR technique. Sickle cell anemia is most prevalent hereditary blood disorder in emerging economies. For instance, according to WHO, millions of people globally are affected by sickle cell anemia requiring accurate diagnosis that will substantially stimulate the demand for PCR technique in upcoming years. Diagnostic laboratories segment of immunohematology market accounted for 23.6% in 2017 owing to the increasing R&D efforts for drug development activities. Extensive use of immunohematology devices in diagnostic laboratories for diagnosis of disorders such as iron deficiencies will augment the business growth in forthcoming years. Moreover, increasing diagnostic laboratories in developed as well as developing countries will escalate the demand for immunohematology devices boosting the industry growth in forthcoming years. China immunohematology market witnessed 6.6% CAGR in 2017 and is anticipated to grow exponentially over forecast timeframe. Increasing prevalence of blood disorders will enhance the industry growth. According to BMC Public Health, in 2015, number of pregnant women suffering from anemia has increased during the recent years that has resulted a hike in demand for immunohematology systems escalating the industry growth. Also, developed healthcare infrastructure ensures availability of advanced immunohematology systems driving the immunohematology market growth. Germany immunohematology market accounted for 20.0% revenue share of Europe market. Europe based companies focus their efforts on integrating advanced technology into the immunohematology devices. Accurate analysis and blood group determination enabled by these technologically advanced immunohematology diseases will ensure high industry growth during the forecast timeframe. Moreover, increasing number of blood transfusions will favor the demand for immunohematology devices escalating the immunohematology industry growth in the upcoming years. Prominent industry players in immunohematology market includes Thermo Fisher Scientific, Beckman Coulter, Hologic, Siemens Healthcare GmbH, Grifols, Ortho Clinical Diagnostics, Immucor, BD (Becton Dickinson), Abbott, MTC Invitro, Antisel, Roche Diagnostics, Bio-Rad Laboratories. Eminent industry players adopt strategies such as geographic expansions, acquisitions, mergers, and new product launch to sustain market competition. For instance, in March 2016, Grifols, leader in producing blood-plasma based products invested USD 360 million to expand capacities for blood-plasma therapies that would help it expand its hematology product portfolio thereby, fostering company’s revenue generation.